Dip-buyers are making their usual stand today, with small caps leading a ferocious bounce off the morning gap down and not yet slowing down. 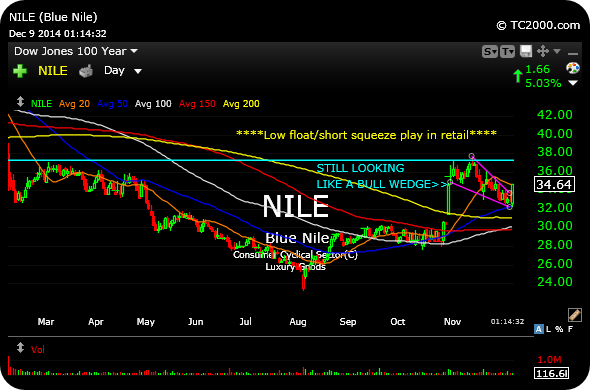 If we do get the typical bounce or drift into year-end, I still think Blue Nile can work well as a long idea in the specialty retail space. The low float/heavily-shorted online jeweler is capable of finally surging over $37, especially given today's impressive rally. On the updated daily chart, below, note the importance of the $37 level (horizontal light blue line), as price threatens to break higher up and out of the falling wedge pattern (purple lines). This is still a chart in need of improvement. But the potential is still there for a year-end squeeze. I would not want to see the stock loses $34 again, below.